This Hi Low bed features a 7″ to 30″ range of motion. This allows the bed to be raised to a waist height to assist the caregiver in doing various treatments and clothing changes with ease. It also enables the bed to be lowered to assist with transfers by matching the bed to chair level. It is extremely useful for leaving the bed at a low height for shorter individuals or as a safety precaution for those that are a potential fall risk. The benefits from such flexibility are endless. This bed also offers an integrated width extension. This allows the sleep surface to expand or retract to 35″, 39″, or 42″ in width. The therapeutic grid surface allows for multiple mattress designs to lay on its foundation including orthopedic style mattresses. 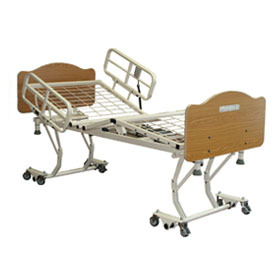 A variety of accessories are also available with this model including trapeze attachments, bed rails, and several different styles of head and foot boards.